Florida manatee, Trichechus manatus latirostris, a subspecies of the West Indian manatee, endangered. 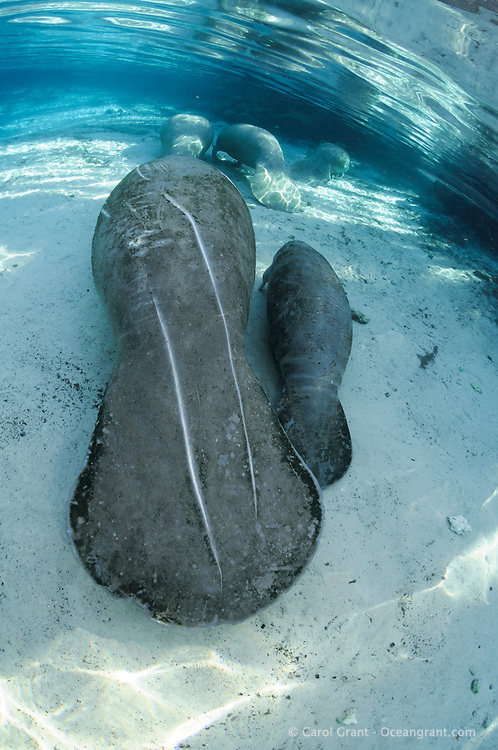 A mother and calf rest along with other manatee by a warm blue spring. The mother has substantial injuries caused by the skeg of a boat motor or two boat motors and some scars caused by a propeller. Vertical orientation with blue water and rainbow sun rays. Three Sisters Springs, Crystal River National Wildlife Refuge, Kings Bay, Crystal River, Citrus County, Florida USA.